Find artworks, auction results, sale prices and pictures of Rufus Hathaway at auctions worldwide. 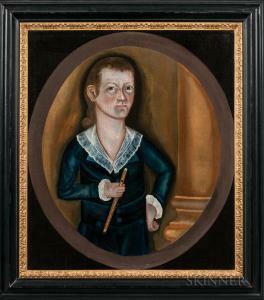 Description: Rufus Hathaway (Massachusetts, 1770-1822) Portrait of a Boy with a Fife Unsigned. 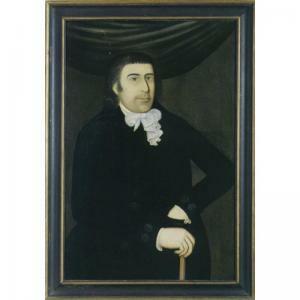 Oil on canvas, 30 x 26 in., in a later molded black-painted frame with gilt liner. Condition: Relined, repaired vertical tear in canvas with retouch. Provenance: Joan Brownstein, American Antiques Show, New York, January 21, 2006. Literature: Plain & Fancy: A Survey of American Folk Art, exhibition catalog. Exhibitions: Plain & Fancy: A Survey of American Folk Art, Hirschl & Adler Galleries, New York, April 30-May 23, 1970. 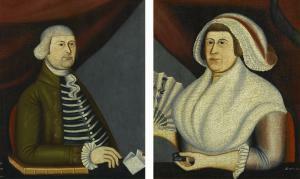 Provenance: The Arthur & Sybil Kern Collection of American Folk Art. Captain and Mrs. Pollycarpus Edson; Sarah Edson Eddy, daughter of Capt. and Mrs. Edson; By descent to the Eddy Homestead, Middleborough, Massachusetts; Vose Galleries, Boston, Massachusetts. In 1790, Rufus Hathaway was an itinerant limner working in southeastern Massachusetts, and by 1791, he had settled in Duxbury. Because his father and grandfather were both ship carpenters, it has been theorized that Hathaway may have learned to paint in the ship building and decorating trade. His artistic career was short—he painted little after 1795, the year he married Judith Winslow, the daughter of a prominent local merchant. Soon thereafter, he became a physician. Hathaway\’\’\’\’\’\’\’\’s portraits are consistent in their simple style, but also in that even in their simplicity, their subjects clearly exhibit wealth and status. Captain Pollycarpus Edson, who was named after the martyred Bishop of Smyrna, rests his arm on a ledgerbook, and he wears an expensive striped waistcoat and an overcoat with carved buttons. 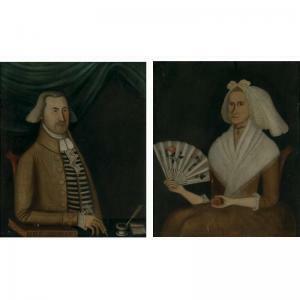 His wife, Lucy Eaton Edson, wears pearls and holds a handpainted fan. The Edsons lived in Bridgewater and had five children. the painting and gilding of six more at 3 shillings. Winsor, the subject of one of his portraits, on December 10, 1795. Edgar William and Bernice Chrysler Garbisch. Nina Fletcher Little, "Doctor Rufus Hathaway,"
(Boston: Museum of Fine Arts, 1976, pp.